Airmen from the 920th Rescue Wing revalidate their response time in the event of a catastrophic, life-threatening occurrence within the capsule of a human space flight launch, Oct. 25, 2018, at Kennedy Space Center, Fla. This exercise marked the first time that the Department of Defense, NASA and commercial providers have exercised this type of event utilizing 12 live patients and the full array of air assets. Their mission was to respond to a simulated emergency incident that required DOD support and expertise. 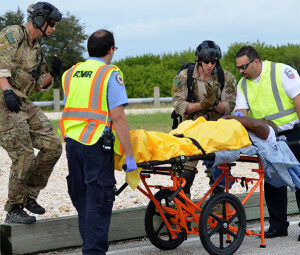 The exercise included twelve participants role-playing various injuries after a launch pad emergency. The DOD HSFS Office planned and coordinated 920th RQW assets which included two HH-60G helicopters from the 301st Rescue Squadron, four pararescuemen from the 308th RQS and two flight surgeons from the DOD HSFS Office. This exercise revalidated the response time of the Airmen and aircraft from Patrick Air Force Base, to Kennedy Space Center in the event of a catastrophic, life-threatening occurrence within the capsule of a human spaceflight launch. This was also the first time the DOD, NASA and commercial providers have exercised this type of event utilizing live patients and the full array of air assets, according to HSFS. When the final mission of the American Space Shuttle Program, Space Transportation System – 135, launched in July 2011, it marked the end of an era not only for NASA but also for the 920th Rescue Wing Reserve Citizen Airmen who had served as guardians of the NASA astronauts for five decades. That seven-year hiatus will come to an end next summer.